Water purifiers (filters) have been used throughout history to improve the aesthetics and safety of drinking water. The earliest recorded attempts to find or generate pure water date back to 2000 b.c.e. Indeed, early Sanskrit writings outline a range of methods for purifying water including boiling or placing hot metal instruments in water before drinking it, to filtering that water through crude sand or charcoal filters. These writings suggest that the major motive in purifying water was to provide better tasting drinking water; it was assumed that good tasting water was also clean. Over the years, residential water purifiers have evolved significantly; their quality has improved and they have become more affordable. In addition, their ability to filter out finer particles has improved. Drinking filtered water instead of tap water can give your family many health benefits. A water purifier’s main job is to remove harmful elements in the water, which can include lead, chlorine, rust sediment, dirt and algae. These devices also remove bacteria which can cause illness such as giardia, E. coli and cryptosporidium. However, don’t think using a purifier means sacrificing the good parts in tap water; most are manufactured to leave in the beneficial minerals such as fluoride, which is often added to tap water to prevent tooth decay (depending on countries and regions). Choosing filtered water over tap water will give you water that tastes and smells cleaner, while reducing your chance of illness and giving you better overall health. Installing a water filter is also a cheaper and more environmentally friendly alternative to drinking bottled water. Today the most popular filters are countertop, stand-alone filters, such as Waterco’s Stoneware purifier, which do not require any plumbing or electrical connections. Waterco offers a comprehensive range of water purifiers, from counter top units to DIY units to plumbed under-sink water purifiers. Filtration, which takes out dirt, algae and rust. Purification, which removes things such as bacteria and dissolved metals. Minimal maintenance and low running costs are some of the other benefits of this filter. 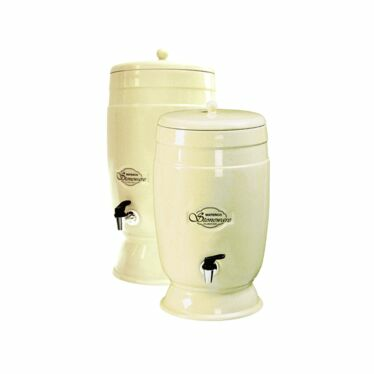 The Stoneware Gravity water purifier uses the power of gravity to pull tap water firstly through its ceramic filter cartridge, then through activated carbon to deliver pure drinking water. Made from porcelain, this portable unit requires no plumbing work, as it will operate as soon as you fill the upper reservoir with water. This filter eliminates harmful bacteria, dirt, chlorine, organic pesticides and dissolved metals from your drinking water.